Richard Smith has spent the past year and a half developing an easy-to-use mapping application with first responders in mind. Smith, an assistant professor of geographic information science at Texas A&M University-Corpus Christi, envisions emergency personnel using his SituMap application for serious emergencies, such as campus shootings, as well as for planning exercises, severe weather events and minor incidents. Having access to floor plans, real-time traffic and weather data and touch-enabled maps help personnel develop clear and effective response plans quickly. 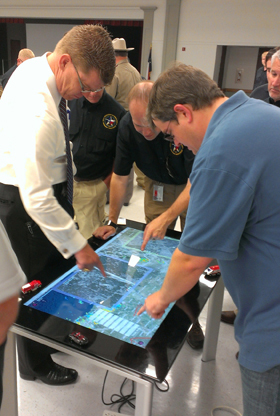 Think of SituMap — short for Situation Map — as a digital command center for law enforcement and other emergency responders. It is a digital map, much like the Google and Apple Maps, but it offers much more. The Texas A&M University-Corpus Christi Police Department uses the app on a 55-inch touchscreen for its daily briefings, which are now completely paperless. The app supports up to 50 simultaneous inputs, meaning multiple users can work on the map at the same time. Users can measure distances and area sizes, find locations, view floor plans, draw and erase routes, detail where fire trucks, ambulances and squad cars need to go and share versions of detailed maps with mobile users. Check out the SituMap demo below. Texas A&M University-Corpus Christi Police Chief Alan Gutierrez, who has been in the business for 30 years, says he was looking for a tool that he could use every day and not only during emergencies. His team recently used SituMap to respond to a gas leak on campus, and Gutierrez says the department is looking at expanding the use of the app for campuswide emergency operations. Younger detectives embrace and expect these types of digital capabilities, he says. The app was designed to run on any Windows-based touchscreen device, including the Surface Pro 3 and laptops. Smith is working with the Texas A&M System Technology Commercialization (TTC) to bring his product to market. If the product proves popular in the marketplace, the next step would be to create versions for Android and iOS devices, Smith says. Maresh-Fuehrer is collaborating with Smith to identify how the app could aid first responders during emergencies. Along with SituMap, Smith has developed an app called PhotoSorter, which allows emergency responders and members of the public to email photos and video. Those visual assets can be integrated with SituMap, providing first responders with greater situational awareness on the ground. The university has another tool at its disposal that could provide more up-to-date imagery on the ground: a drone. The Federal Aviation Administration named the university a test site for unmanned aircraft systems, allowing it to research how drones can be used safely to support law enforcement support, help preserve the ocean and more. Smith says he plans to do tests in the future to see how quickly drone data can be integrated into applications like SituMap. But the app isn’t only for public safety professionals. SituMap could be used to plan emergency evacuation routes or show people where to take shelter during a shooting. “Crisis planning is so important that people are being held accountable for not doing planning,” Maresh-Fuehrer adds.